Vacations are about experiencing and seeing new things – and then gloating about them to friends and co-workers back home. A group of travelers who recently took a trip to Mexico’s Sea of Cortés will have plenty of material for water-cooler parleys after this adventure. While kayaking, they came across two 15-foot oarfish, which belong to an elusive species of deep sea fish that has inspired countless tales of brushes with sea serpents and is rarely spotted alive. Unlike the stuff of legend, the recent sighting of the giant oarfish was totally legit. One wise vacationer got some of the oarfish encounter on video. As seen in the footage of the oarfish posted to YouTube, the 15-foot fish swam into shallow waters and circled the kayakers, who were affiliated with Chicago’s Shedd Aquarium. 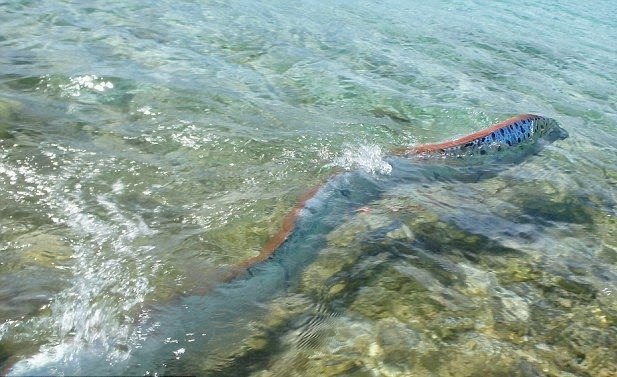 At one point, one of the oarfish nearly makes its way completely onto the shore. Someone with a kayak paddle scoots the fish back into the water, where it takes off and passes underneath one of the kayaks. “My God, look at the size of that thing!” one of the kayakers exclaims. Oarfish, the world’s largest bony fish, are rarely seen in the wild. Until recently, biologists knew very little about them. They live in temperate and tropical waters around the globe and typically spend their days between 650 feet and 3,000 feet below the surface. Oarfish can grow up to 36 feet in length, with some specimens exceeding 50 feet. Humans’ encounters with oarfish usually occur only when corpses wash up on the beach. Last year, snorkelers on Catalina Island off the California coast encountered a dead 18-foot oarfish, which they towed to shore and photographed. A few days later, a 14-foot oarfish corpse turned up north of San Diego. Legend maintains that the appearance of an oarfish is a sure sign of an impending earthquake. But the jury is still out on whether the myth has any scientific standing. “Deep-sea fish living near the sea bottom are more sensitive to the movements of active faults than those near the surface of the sea,” Kiyoshi Wadatsumi, director of non-profit earthquake prediction research organization e-PISCO, told the Japan Times in 2010 following several sightings of oarfish near the Japanese coast.